Tonight is Hıdrellez in Turkey, celebrating spring and the day on which the Prophets al-Khidr and Elijah. Traditionally wishes come true today and it would seem that President Erdoğan’s wish for an executive Presidency has come one step closer to reality with the resignation of Prime Minister Davutoğlu. When we downgraded Turkey in last week’s Governments and Marketsupdate, it was primarily due to negative shifts in governance as the pressure to move to a Presidential system and crack down on the Kurds increased. We weren’t sure of the timing of these events, although key factors like the HDP being effectively banned and the President needing to assert control over more elements of the government seemed certain. 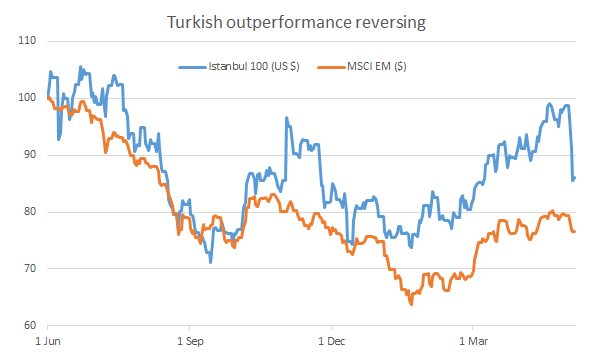 Taking some cash off the table after a period of Turkish outperformance seemed sensible and we must now consider where we go from here with Turkish equities having fallen 10% this week alone. 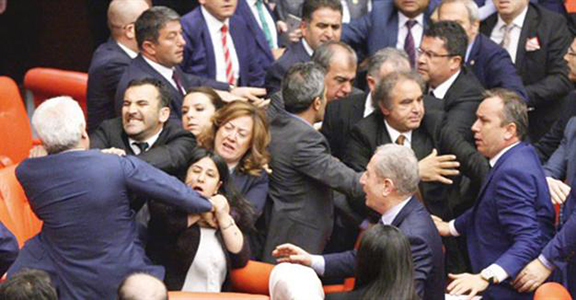 While the resignation of the Prime Minister is the main headline news, the start of this week saw jitters following a brawl in the Turkish parliament as the process to strip MP’s of immunity to prosecution began, something that would impact HDP members given accusations of PKK ties, but also some MHP members. This move was in line with our expectations and unsurprising given the continued escalation of deadly suicide attacks by the Kurdish TAK, linked by the government to the PKK, who are in turn linked by them to the HDP. The March 13th suicide car bomb attack on Ankara was particularly alarming as it confirmed the return of Kurdish attacks on civilian targets, with 37 being killed. The Syrian civil war has dramatically increased the available ordinance for such attacks, designed to maximize casualties with the car in this case being packed with nails and pellets, injuring a further 127 individuals. The moves by the security forces to push Kurdish separatists out of their urban areas are likely to increase the frequency of such attacks, providing a grim echo of the 90s when they first started. This is a continuation of the process of reducing Kurdish political influence that we outlined in our notes “A Kurdish Conundrum” on July 31st last year and “Ankara: Cui Bono?” on 20th October 2015, where we predicted the AKP majority and continued political polarization that has occurred. We also saw continued developments in the chaos that has surrounded the MHP and efforts to oust Bahçeli as leader after 19 years, with the judiciary blocking the proposed extraordinary congress that could make the rule change necessary for a vote to kick him out and accusations by Bahçeli that Gülenist forces are behind this move. This puts the opposition to the AKP in a bad spot even as the leadership of the AKP becomes ever more streamlined, a process that we saw with Cabinet III and likely required after the public splits that we started to see last March with the running of Fidan and the Gökçek-Arınç feud. Given the current constitutional powers of the President versus the Prime Minister, Davutoğlu was the only potential political force that could stop the President from exercising almost unlimited executive powers, although this would have amounted to a semi-coup within the AKP that Erdoğan officially left upon taking up the Presidency, but clearly still controls. The expectation of Davutoğlu that he would be able to exercise his constitutionally mandated powers versus being effectively a Vice President appears to have been the real catalyst that led to the current situation, something hinted at with the arrival of the “Pelican Brief” blog on May 1st, a pro-Erdoğan blog accusing Davutoğlu of helping the cause of Erdoğan’s enemies (conspiracy theories are popular in Turkey) and not doing enough to advocate the Presidential system. He was also accused of not protecting Erdoğan against attacks, notable when 1,800 have been charged with insulting the President as the space for public dissension continues to narrow, supporting Kurdish peace, something that Erdoğan no longer cared for and other such calumnies. While the blog is anonymous, it fit with news that broke shortly after that, after agreeing a politically important military base in Qatar for Turkey, Davutoğlu had been stripped of many of his powers as party leader by almost all of the members of the AKP’s Central Decision and Administration Board, backed by Erdoğan. This was referred to by Davutoğlu as a key reason for his resignation, although he still voiced his full support for Erdoğan. Any new Prime Minister is now certain to be a Erdoğan loyalist when the party congress meets at the end of May, raising the question as to why any constitutional amendment is now needed given the President controls almost all elements of governmental power and has consolidated influence over key institutions such as the central bank. We may see elections in October if they decided to try and kill off the HDP and MHP, for now it appears that, absent a possible reshuffling of some of the AKP ranks, this is merely the latest step in the formalisation of the President’s rule. Polls show support for a Presidential system isn’t tremendously high, which would argue against putting it to a public vote when the powers are all in place already. Where does that leave Turkey in terms of governance and likely asset performance? Markets were troubled last year by the prospect of a shake up in the AKP as they lost their parliamentary majority, before jumping after elections and subsiding once more. By and large, the bourse, dominated by foreign investors, tends to favour a firm hand at the tiller and predictability, which should augur well for the Presidential system. Economic policy is unconventional, but now quite predictable and Turkey has benefited from the tailwind of lower oil prices, although we are now starting to see pressures resume upon the economy and current account. What investors hate, however, are governance regimes in which the state interferes with private enterprise, something that we have seen in the crackdown on and seizure purported Gülenist companies and continued consolidation of the press, with the takeover of Feza Media and Zaman the latest in this series on terror support charges. It should now be the case that Erdoğan has sufficient support and has shown enough strength not to go after additional targets like Isbank, where the CHP has a 28% stake. If so, our neutral rating is optimistic. If not and we now get a period of relative stability as all challengers have been dealt with, then the market looks good here on a relative basis, with banks in particular the second cheapest in EM after Chinese banks and in a supportive rate policy environment, but still offers little upside on an absolute basis with most of the action likely continuing to be on FX and bonds. If this rally in EM is just that and not a secular turning point as we expect as Chinese vulnerabilities continue to expand, then the real test for the government and its relationship to the corporate sector will be when the market turns south once more. Will Turkey become an “Islamic” state? On a final note, we have had a couple of queries as to whether Turkey is headed toward Shariah law implementation as the Presidency is consolidated, particularly given Parliament SpeakerIsmail Kahraman’s comments that secularism should be taken out of Turkey’s new constitution last week, moving it instead to a “religious constitution”. While we are dubious on the impact of any constitution (look at North Korea’s, its fabulous), we think that an overall shift to an Islamic state is unlikely in Turkey as the impact the AKP is looking to achieve, namely normalisation of Islamic practice in public as a foundational support for party control and roll back of the restrictions of prior governments. This doesn’t require a change in the constitution, nor does it require a formalisation of Islamic law within the country as a guide to government policy, something which is better served by the use of “public interest” (maslaha) doctrine by the government in any case, which provides significant flexibility in promulgating policy. This is similar to the interaction between religion and government we are seeing today in Russia and a sensible step to take as Turkey goes down a more conservative route for a leader who wants to consolidate control. The decisions made on state capitalism on this path will likely be the ones that determine the success of Turkey in the coming years and something the President will be judged on as he gets his wish.